Our metro Denver hotel package offers convenient access to Denver's business communities. 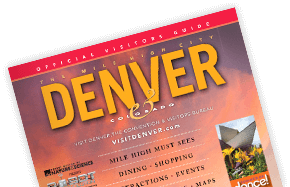 VISIT DENVER can help you quickly find the right downtown hotels for your Denver meeting or convention. View a local map and try our hotel search tool. Cherry Creek offers a large number of hotels rooms within walking distance to some of Denver's best dining and shopping and close to Downtown core as well. Denver-area resort hotels offer ideal venues in spectacular settings for meetings, conferences & events outside the metro area. Start your search now!